It was with honor and respect for our veterans and their families that the National Cemetery Administration authorized the new Miramar National Cemetery. The cemetery can accommodate in-ground casket burials, in-ground burial of cremains, and provides columbarium spaces for placement of urns. The Miramar National Cemetery Support Foundation is responsible for coordinating memorial events, and providing patriotic monuments and other enhancements at the new cemetery. One such project was the installation of the striking Avenue of Flags that has become a focal point of the cemetery. 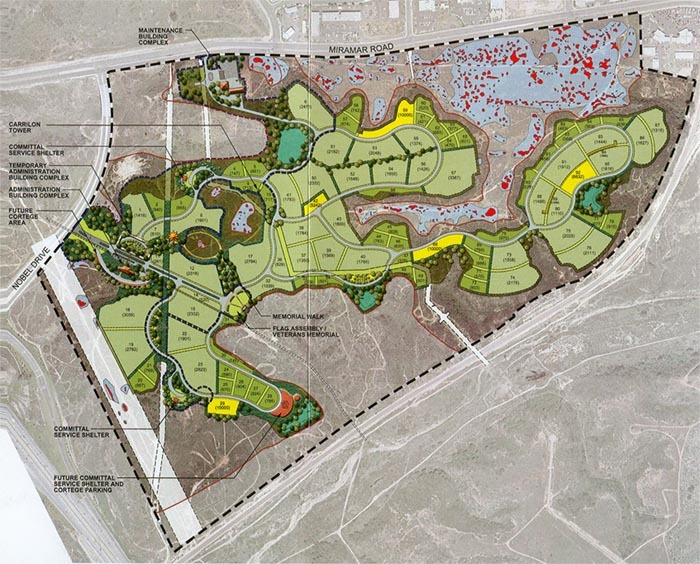 The new 313-acre cemetery will be built in six phases. Each phase will have 12,000 dual cement burial vaults with headstones for casket burials, plus columbarium walls with 10,000 niches for cremated remains. In addition, each phase will have 2,500 in-ground burial spaces with headstones for cremated remains. Phase One opened for burials in November 2010. When Phase Six is completed, the cemetery will have space for 161,000 burials, and will be able to accommodate the needs of San Diego’s veterans for 60 years. The Miramar National Cemetery Support Foundation looks forward to your contributions in helping to make this last resting place a shrine to the sacrifices of our veterans and their families. You can contribute to the work of the Support Foundation. To learn more, please click here.